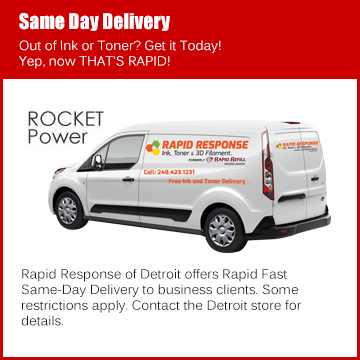 Rapid Response Ink and Toner – Southfield, Michigan – Metro Detroit's Best Source for Ink and Toner For Over A Decade! Shop with Rapid Response Ink, Toner, & 3D Filament and experience why we are the consumer choice for all your print supplies needs. When you’re out of ink and toner cartridges – we’re there with our Rapid Fast delivery – from store to door! We offer an extensive selection of printer cartridges, laser toner, ink cartridges, ribbons as well as many other printing supplies, refurbished printers and even printer maintenance & repairs. 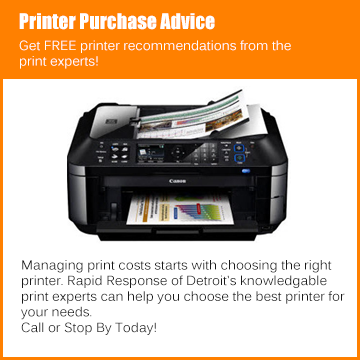 At Rapid Response Ink, Toner, & 3D Filament we are your local source for printing smarter. See our expertise in action with this video explaining a little about our process! Rapid Response Ink, Toner, & 3D Filament carries print cartridges for all major brands of ink and toner print cartridges like HP, Lexmark, Brother, Canon, Epson, Dell & more! See the map below and stop into our store today! Rapid Response Ink, Toner, & 3D Filament stocks an extensive lineup of print solutions products including Rapid Response brand laser toner cartridges and popular brand name inkjet cartridges for virtually every printer on the market, all backed by our Satisfaction Guarantee. At Rapid Response Ink, Toner, & 3D Filament, we’re confident in the quality of our products – which is why your satisfaction is guaranteed with a full 60 day money-back buyer-protection on all Rapid Response branded products. It’s just that simple. Request A Free Commercial Savings Analysis and See How Much Your Business Can Save! CLICK BUTTON BELOW TO SEE OUR REVIEWS!